Minute for minute, treadmills are the ultimate fat burning machine, eliminating up to 900 calories an hour. 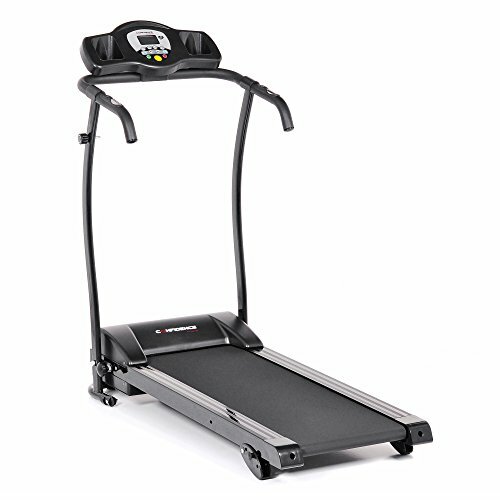 The Confidence GTR Power Pro treadmill has an adjustable manual incline (3 settings), a top speed of 7.5 mph, 12 built in fitness programs, a heart rate monitor and many more features that make this a great treadmill at an unbelievable price. It is ideal for people new to running and those looking to shed a few extra pounds, and with it's folding design and wheels, it is easy to store and roll away. 1100W / 1.5 hp motor. Runway Size: 43.5" x 15.75". Full product size: 52" x 25.2" x 52". Folded dimensions: 54" x 25.5" x 23". Weight of machine: 62 lbs Weight & Size of delivered package: 56" x 27" x 11" 68 lbs.